The Great Mosque of Algiers (Djamaa el Djazair or El Djazair Mosque) is located in municipality of Mohammadia in Mitidja, 10 kilometers East of Algiers, Algeria. 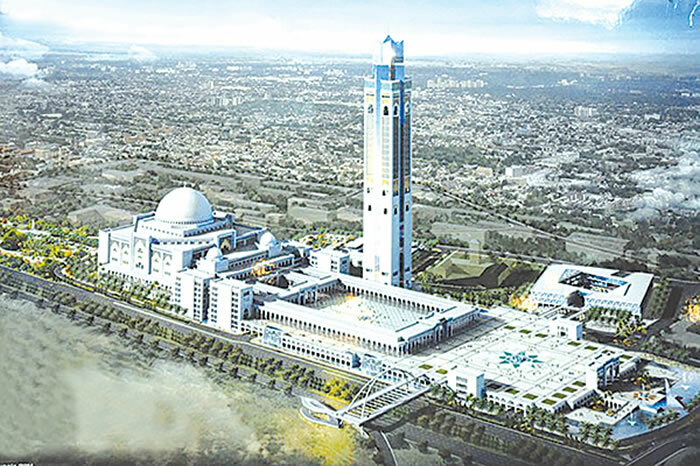 Thanks to its minaret ‘s size of 270m high and an area of 375,000 sqm, it will be the largest mosque in Africa and the third largest mosque in the world after Masjid el Haram in Mecca and Masjid el Nabawi in Medina. El Djazair Mosque is expected to host more than 120,000 Muslims. The first pouring operations of concrete foundations began on August 16, 2012, after a kick-off ceremony. It was the Chinese Company "China State Construction Engineering "(CSCEC) which was responsible for the construction of the El Djazair Mosque. The architecture of the mosque is square geometry linking modernity with traditional; the design team consisted of more than 100 architects and engineers. It is financed by the Algerian state for an initial public budget of one billion Euros. The Great Mosque is equipped with a prayer hall with an area of 20,000m .In the eastern part of the prayer hall , there is the Mihrab, made of white marble, which is used by the Imam to direct the five prayers of the day. In this part we find the Minbar, a high pulpit used by for preaching. The mosque has also several ablution rooms where the faithful are purified before praying; the ritual consists of washing hands, mouth, nose, face, forearms, head, ears and feet. The mosque’s minaret is divided into various functional areas that are served by two panoramic lifts to the tip of the tower. A spacious entrance area, with a large foyer, is planned in the foot zone of the minaret. A museum, a research center for art and Islamic history, four "sky-lobbies", a panoramic platform located on the floors of the minaret. A dynamic tour open to the public that is distinguished by its height and which houses in its different levels a reception area that can also receive exhibitions, a museum of art and history of Islam through 15 centuries, spread over 15 levels, a research center in the history of Algeria, an observation platform of the bay of Algiers and its surroundings as well as a first necessity trade and a restaurant. The mosque has a dome that covers the prayer hall. This dome was made in China and sent from Shanghai on May 6, 2016 to be placed after the month of Ramadan. This mosque also has “Quran School” that allows Algerian or foreign students to deepen their knowledge of Islam and Islamic culture. This great Quran School, a place of higher education, can accommodate up to 300 graduate students in Islamic Sciences. It includes classrooms, a multimedia room and a conference room. Accommodation for students and professors is also planned giving an academic campus atmosphere in the South of Djamaa el Djazair. The mosque has benefited from an ornament and decoration entrusted to a specialized international design office and made by Algerian craftsmen, basing on the identity of Algerian society in its Amazigh and Arab dimensions. The mosque has a cultural center with 1,500 seats which includes an exhibition hall, a library; a media library, a video library, a film library, two amphitheatres; a 500 seat amphitheater with a projection room, a cinema working with a capacity of 30 to 50 people, art workshops, a computer center, an administration area for the management of the cultural center and a cafeteria .The mosque has an Islamic institute, several gardens ,a car park of 6,000 vehicles, a hotel with 300 rooms, seminar rooms , shopping center , restaurants ,leisure park and many administrative buildings. Moreover, El Djazair Mosque was built in accordance with modern seismic parameters to make this Islamic work resistant to a major earthquake. It is able to withstand a major earthquake of 7.3 degrees on the Richter scale using a combination insulators and viscous dampers, in addition to a series of reinforced concrete sails in both directions North, South and East, West. There are several ways and means which lead to Djamaa el Djazair from the suburbs of Algiers. They can be reached by car or bus by an Algerian road network formed by the RN5, RN11 and RN24 national roads, or by the tramway of Algiers. This mosque is even equipped with a helicopter station that is devoted exclusively to professional missions and health transport of patients.